This medium-size, spherical seed has a nutty, sweeter and mellower burning flavor, with a taste sensation similar to horseradish. 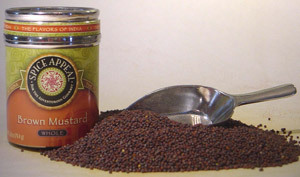 Toast in heated ghee or oil, and add to Southern Indian sauces, chutneys, pickles, curries, sambars and dals. Tastes great in Caribbean sauces, marinades and stews.